I have no idea how I acquired this particular item. If you are not familiar with it, it is a cube which comes pre-assembled. Yes, it is already put together (or the one I have was anyway), so it is impossible (or close enough to it) to store it with the other cards in my binders. I am going to have to buy something to keep it in, or use a card storage box to keep my card "box" in... Yeesh... On the plus side, though, it makes for a very cool conversation piece! It features several different poses of the player, a list of recent stats, bio info, a little player blurb, and the card number with copyright info. I know very little about the set, so I do not know if they came pre-assembled or if I am one of the "lucky" people who received a card that was put together then glued for the posterity of it all... I think it has a nice mix of action shots and posed stills. It is colorful with just enough foil to keep your attention without being too gaudy (close though). Shall we start with the obvious: "Sox Rock Rockies" or "Sox Blow Socks Off the Rocks" maybe? Oh, I can see them now... Copy editors (or whoever chooses headlines) were chomping at the bit to see which "witty" headline they could spew forth before some other paper does the same. In fact, by the time this is posted, there will already be stupid headlines all over the place. I got home the other day, and when I checked the mail, I had a padded envelope waiting on me... That's as close to Christmas and birthdays as it gets... :-) I had forgotten about even having cards out there that I had ordered, except for the McDowell mini-poster, and I knew enough time hadn't passed for that to arrive yet. So when I opened the envelope, I felt like Sid in "Toy Story:" "It Came! It finally came!" 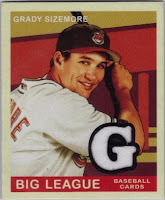 It was the 2007 Goudey Grady Sizemore Game-used card. I don't know why I was so jubilant about getting this card, other than it seems like I had paid for it some time ago, and here it was. As you are most likely aware by now (assuming you have been reading along), I love the Goudeys and to get a Triber such as Sizemore in a game-used version (green back) is very cool. If memory serves, I've owned these cards since they came out in 1981. I am surprised that I never separated them at the perforations, and even more surprised that I didn't play the game on the cards! 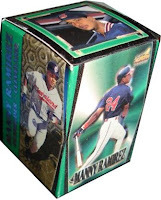 The idea behind these was like lottery tickets for kids (hmm, maybe I could sue Topps for my scratch-off ticket "hobby"). The cards were supposed to be broken apart at the perfs, then divided up into two teams. Nine players on each team from the AL would face off against nine players from the NL in a nine inning baseball game. As each team came to 'bat,' the collector would scratch off one spot. According to the rules on the back (paraphrasing), "Base runners advance one base on a ground out and single, two bases on a double, and three on a triple. There is no advancing on a fly out or strike out. There are no double or triple plays." So, on the backs of the cards, you find place to write the line-up number of the player (Topps assumed that people would lose their place during a game, or perhaps in test marketing, people DID lose their places). The "top" card listed the rules of play. 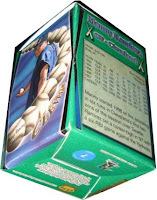 The "middle" card of the unbroken trio provided a scoreboard in which to record runs and hits. 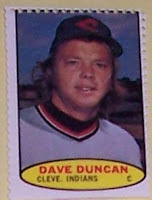 The "bottom" card contained various offers from Topps, like the plastic-shelved "Sports Card Locker" (which I owned at least two that I remember), or the "#445 Ball-Strike Indicator" - a perfect 'tool' for keeping up with you scratch-off game or when you were odd man out in a pick-up game and had to play ump... At least you could "look" official..
As for the photos themselves: I think some of these guys would have made great candidates for Thorzul's 1981 Topps competition (Which, Al Hrabosky won by the way). Cecil Cooper sports not only the 80's ultra-cool beard and 'stache, but he tops it off with those specs! 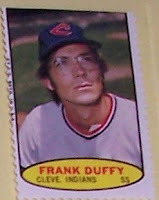 Is it just me, or does Super Joe seem to be squinting in nearly every baseball card ever made of him? I'll have to do a study in a future post on that one.... Manning, on the other hand, has that usual, "Hey, I'm Rick Manning, and I am COOL" look.. LOL. Mike Hargrove has always looked like a manager/coach to me. Even in his rookie days, there is something about him that says, "I play, but my real dream is to manage..."
Okay, let me get this off my chest, and then it will be time to move on: It was, apparently, NOT Tribe Time Now. I watched as the Indians came close to tying the game (of COURSE Skinner should have sent Lofton home, DUH!) and continued to watch as the Red Sox put their collective foot on the gas pedal, burning rubber and leaving my beloved team in the dust. The players and administrators of the Red Sox surprised me with their remarks, talking about how classy the Indians are, what a great TEAM they are, how hard a fight there was. Frankly, I was surprised. I expected trash-talkin' and gloating. Of course the Sox celebrated, but they did it while tipping their hats to the Tribe. I wanted the Indians to win. It's been a long time since I watched as many games as I did this year, especially during the post season. Ryan Garko has a blog at MLB, and the comments left by the readers are touching and sometimes poignant. Yeah, there are some stupid people cussing and gloating or whatever, but for the most part, Indians fans and Red Sox fans congratulated Garko and the Tribe for an incredible ride this season. A couple people even admitted to crying after they knew it was over, even before the final out. There is something special about being a fan, a true-blue fan, of a team - whether baseball, football, pro or semi or college. Even though you may not have any real bearing on the game or the players, you FEEL like you do. You feel as if those folks are a part of you, and when you see them with tears running down their cheeks after a tough loss or you see them dancing like maniacs after a victory, it is as if you are there with them, sharing in their pain or joy. 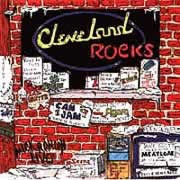 I have been a Cleveland Indians fan for many years, most of my life, really. I grew up in Pittsburgh, and though the Pirates have a special place in my heart, nothing compares to the attachment I have to the Tribe. After Game 4, I saw my team change. Something happened, and though they tried to get passed it, they never did. That is not to say our guys did not play hard. Not at all! They played their hearts out, but were ultimately unmatched. I have loved the Tribe though pretty rotten years (can anyone say 1980's? ), and through some pretty great years. I will always be a fan of the Tribe. Get some rest, boys - let's get back here next year! Isn't that the mantra we've been spouting for at least a month and half now? We are Tribe fans, for crying out loud (which many of us are doing lately). 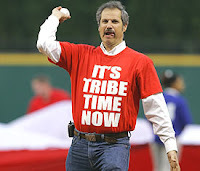 It's Tribe time now. Perhaps the watch needs to be wound (a reference I fear may be lost on some), but I believe it IS that time. I tried to find a cute picture of a wagon with the wheels coming off, and being unsuccessful at that, opted to look for ANY picture of wheels coming off of ANYTHING, I decided that the few pictures I found were neither cute nor any good. I have decided that means the wheels AREN'T coming off the Tribe, and that they will return to playing ball following the extrusions of their craniums from their posterior orifices (yet another reference which may be lost on some). Batting: Showing us all that he does what he does. 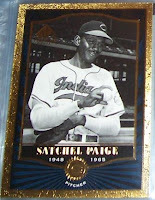 When I get a 200x card of him in Indians garb, I can easily add it here, and I hope it shows him in action. Not many players can play as well as he has, regardless of age. Running: Even when the Tribe was down 4-1, or 10-1 for that matter, Lofton hustles - whether down the first base line or between the bases! I found this while I was looking for something else, but once I saw it, I knew I had to add it to my collection. The main thing that drew me in was the players shown in the proof sheet. Though I love the Tribe dearly, I have often quipped that the Indians are the farm team of the MLB. 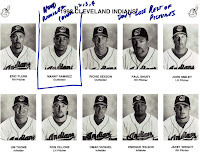 I mean that most of the players that either are GOING to be superstars or who once WERE superstars (or even "commonstars" to borrow the term), seem to find their way through the Indians clubhouse at some point in their careers. Ramirez, Sexson, Shuey, Smiley, Thome, Vizquel, Wright. Heck, some would throw Wilson and Plunk in there as well. Sorry, but Villone's name and career escapes me (and a quick perusal of Wikipedia tells me why). The photos themselves look like something from a Studio set, or maybe even a Wheaties rendition of the team's top players of the day. The writing on the back is full of alliteration: "Feller's Fastball" and "Fleet-Footed Flick." Of these three, Feller is one the one I am most familiar with, so it was fun learning more about the others. I don't know where my fascination with stamps and stickers comes from. Perhaps I was denied such pleasures as a child, or maybe I was punished for peeling them and sticking them to walls of the house, who knows. Nonetheless, stamps (that is, baseball players done on stamps) have the same draw on me today as they did when I was a kid. Charlie Spikes fits somewhere between Gamble and Hendrick on the grooming scale - clean cut with the Elvis sideburns. 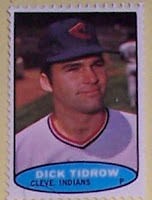 Tidrow basically sports the same look a lot of players give when posing for their pictures. Bell seems a little confused, yet somehow confident. I was a huge Bell fan as a kid. Ellis is trying to look tough, but I don't think he quite pulls it off here. I realize it sounds as if I am bad-mouthing my beloved team's players. I am trying to evaluate their pictures in relation to the era in which they were taken. Some players, like Gamble, Duffy, and Bell, maintained basically the same look for their entire career. Even before this picture was posted, had I said "Oscar Gamble," you would have most likely thought of the guy with the 'fro. Duffy? The guy in the glasses... and Bell is the toe-headed wonder of the Tribe. The bat itself is exposed through a window in the mini card which is (somewhat) aligned to a window in the framed protector. The bat is not glued or attached to the card at all, and slides freely in the provided space on the mini card. I like that Nixon has the bat in his photo planted on his shoulders, running behind his head. That's a nice touch on a G-U bat card. Oh well, aside from my few complaints about the A&G cards in general, I am very happy with my newest acquisition! The Tribe takes out the Yankees in a ALDS Game 4 win, 6-4! Sizemore's 1st inning, 1st batter home run was awesome. Not in the "Man, did you see how far that thing went!?" sense of awesome, but rather in the, "Talk about setting the tone!" kind of way. I admit, by the third inning, I was switching between "Independence Day" and the game because it was dragging. I don't think I have seen such a slowly played ballgame in quite some time. Of course, it was worth the wait! Part of the slow pace was due to Byrd's pitching, and it earned him the Chevy Player of the Game. Yeah, he gave up a couple runs, but he also pitched one helluva game! Now, the question on all (okay, maybe just most) Tribe fans' minds is how well will the Tribe fare versus the Sox? It will not be easy. I'm not saying the Yanks were easy, but all-tolled, it was a pretty easy run for our guys. I think we had better bring a better game than we played during these last two, or we'll be gone before we get there.... Having said that, however, I whole-heartedly BELIEVE! I have stacks (and stacks, and stacks, and stacks) of duplicate Tribe cards. Today, following the utter humiliation suffered after the loss to the Yankees on Sunday, I randomly picked up a small stack, cut the cards, and chose the card at the split. Fittingly, it is the 1991 Score Dream Team card of Doug Jones. Photographer: "Okay, Doug, we need you to stare at the ball. Pretend you're "The Thinker" and you're thinking about your next heater..."
Jones: "What? Couldn't I just sit here and pretend to be Alan Jackson?" Jones: "You know, that country singer. I like his 'stache..."
Photog: "Whatever. We're going to airbrush a flame coming out the ball after we're done." Caterer/Intern: "Oh-mah-gawsh! Like, you mean, he'll be holding a flaming ball!? Yummy!" Jones: "What!? A flaming ball!? No friggin way!" Photog: "Not like that, Doug. Like a super-hot fastball... A heater! (lowers voice) Shut up, Alejandro!" Jones (to team attorney): "Is this really in my contract!?" Attorney: "Well, you see, the thing is... it is not specifically NOT in your contract..."
Photog: "It'll be 'tastefully done' and we're using black & white film!" Jones: "Good God! I'm holding a flaming ball AND it's in black & white!? There goes my career...."
I should have ended this list with only TWO points!! I like stadiums cards almost as much as I like team cards. I just think it is very cool to have a card-sized photo of the stadium where one's favorite team plays. I usually prefer that the checklist on the back actually reflect the team's stadium on the front, but oh well... :-) Since I live in Arkansas, I have not yet made the "pilgrimage" to The Jake, but I will one day! !